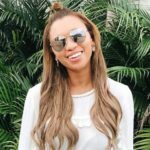 A Texas girl living in the eternal sunshine of south Florida, Autumn Dickens is a personal style blogger whose passion is rooted in helping women gain confidence and creativity through their style. With a degree in writing, she loves sharing her personal struggles with style and advice with her readers on her blog, It's Autumn. Her passion is to inspire and encourage women of all ages to dress their best to be their best. When she's not putting together her next style post, she's either watching a soccer game, scouring Pinterest for her next DIY or snuggling on her bed with a good book.